Back in the 90s, Trixter were very much the babies of the American hair metal scene. The bandmates came together in their teens and were signed to MCA well before their average age hit twenty. Their 1990 debut was hit-filled, smooth, radio-friendly hard rock and the 1992 follow-up Hear! maintained that sound, albeit with a dirtier edge. Stylistically, Human Era is more of the latter but fans will be pleased to know that it is a much more focussed effort than the somewhat scrappy New Audio Machine, their big comeback album from 2012. 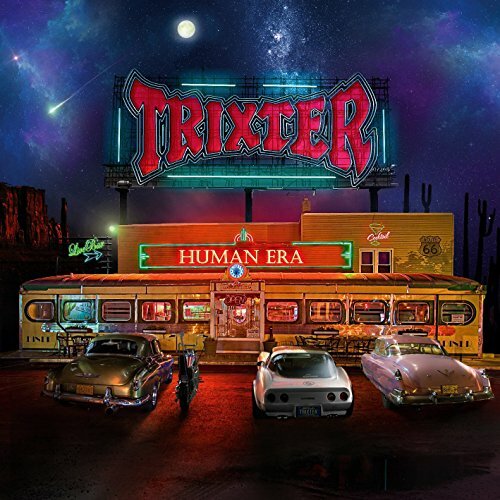 For their second release for Frontiers, Trixter deliver an unapologetic, unrelenting and, above all, unconfused album of pure party rock, closely consulting the textbook by Kiss, Van Halen, Bon Jovi & Poison. Forgivable at the age of seventeen, perhaps, but by now these guys are all well into their forties. Nevertheless, this is an album of completely blind denial: the band never grew up and the last twenty-five years just didn’t happen. They kick off with ‘Rockin’ To The Edge Of The Night’ in which the words ‘boulevard’ and ‘baby’ recur at regular intervals. Do I really need to tell you what this sounds like? Didn’t think so. The stomping ‘Crash That Party’ continues in the same vein and is just overflowing with lyrical and musical clichés, all in the name of asserting one’s right to rock. ‘Not Like All The Rest’ is more feelgood and its gang vocals bring to mind the excellent, solitary album by Bad City. Guitarist Steve Brown then rolls out probably the Van Halenest riff you will ever hear and thus ‘For You’ sets off to pummel you senseless for three and half minutes. ‘Every Second Counts’ is more nuanced and melodic and eases us down a gear for the central ballad, ‘Beats Me Up’: the tale of how life on the road comes at the cost of missing your girl. Reeyul bad. To be fair, it’s as good as anything Bon Jovi have written in the last two decades. ‘Good Times Now’ is up next and follows another blueprint: the celebration of the most sacred part of a rocker’s life, the weekend. This is the only track where Trixter sound just a bit contemporary. The use of auto-tuned backing vocals is conspicuous and the song has an unusually slow pace that reminds me of the swathe of dead-eyed, identikit teen guitar bands that have steadily flashed before our eyes since the turn of the century. Thankfully the fantastic ‘Midnight In Your Eyes’ sees the boys scarpering back to their own era again and normal service is resumed. Lyrically it’s as nonsensical as the title would suggest but it does have a great opening riff, doubled on acoustic and electric guitars and a fist-raising hooky chorus. Couple this with an old-school twin guitar breakdown that would make Messrs Stanley and Frehley proud and yet more genre boxes are ticked. The title track is saved for the album’s close and it tells the story of Trixter so far. ‘Human Era’ is a bromance song, chronicling bandmate camaraderie of ‘Blood On Blood’ proportions but, I have to say, I fell for it hook line and sinker as if I were a fifteen year-old girl. It’s a very strong finish to an album that is so helplessly rock that it has to be taken at face value and enjoyed for what it is. It feels genuine; innocent almost.